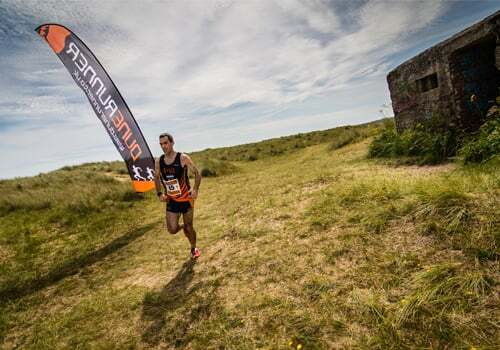 A beautiful, sunny day on the Norfolk coast heralded Steve’s first experience of a Dunerunner (one of our team sponsors) event and he couldn’t praise it more highly. After a few easy weeks post London and Liverpool Marathon events, Steve said, ” I knew I wasn’t in top shape, but the countdown to the start commenced (this being a 5 min, custom written, high tempo dance number with a Get-Go horn at the end – genius! ), and we were off”. Going hard from the front, as always, Steve soon found himself ahead of the main pack as they reached the ‘Slope of Doom’ – a 100m, 40-degree slope of open, soft & deepish sand!. ” This wasn’t too much of a problem, but once I hit the very soft sand, however, I soon found out why I’m predominantly a road runner!” Steve wasn’t sure if his style didn’t suit the very soft surface or if he was in the wrong footwear. He found himself sinking deeper and deeper into the sand and using a lot of energy just to stay upright and keep moving forward: “Along the whole of the beach section I could feel my hamstrings getting tighter and tighter. Eventually, this caused me to stop and stretch out, and it was during this time I got overtaken and fell into second place. From this point it was just a case of survival over the dune section and along the bridle path to the finish (outside of The Nelson Head Pub); I was closing on the leader, but each time I lifted the pace my hamstrings started to scream so was forced to ease up. I finished in 2nd position and a good way ahead of 3rd place.” More off-road and dune running practise planned! Thanks to Martin and his team of marshals for a great event and I hope to return soon, but maybe for their Rag-It-Round Repps Trail/XC event in November instead of the gruelling sand!